Mountain View Border Collies has teamed with Royal Kennels to maximize resources and experience to further the Border Collie breed. Our kennels have expanded since 2011 when Royal Kennels moved here. We have a Face Book presence and appreciate every "like" we get from the public and peers. The basic website needs to be revamped and updated. There are a lot of changes going on here at Mountain View Ranch. The lone pine tree down by kennel yard managed to succumb to the high winds this winter. The old barn came down this weekend and will make room for a new building. How it withstood the winds over the years is still a mystery! It took a piece of machinery to finally get it down. There have been many changes here at Mountain View this past year. Kennels have been modified. New puppies arrived from the Netherlands. Several dogs have gotten their championships and grand championships. 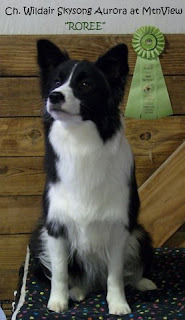 We attended Border Collie nationals in Oregon and traveled to Florida to attend Eukanuba. Most of our news and pictures of changes can be followed on Facebook - Royal Kennels. Wow!! It has been over a year since the last update. Some changes happened here at MtnView. Royal Kennels have re-located to the MtnView Ranch near DeSmet, Idaho. A big "Welcome" goes out to Ronna Stewart and her Royal Kennels. Roree is up for adoption. Please visit her blog for update. Roree with her sweeps ribbon at the BC nationals.